Since our establishment as a state, women of every age, race, ethnicity, and economic background have made historic and significant contributions to the growth and strength of Pennsylvania. During the Revolutionary War, Mary Ludwig Hays McCauley and Margaret Cochran Corbin fought in battles against the British and were among the first women to receive military pensions. Betsy Ross, who is widely credited with making the first American flag, was a proud Philadelphian Quaker. In the late 19th century, Ida Tarbell’s pioneering investigative journalism revealed the unfair practices of the Standard Oil Company. Philadelphian vocalist Marian Anderson, who would later debut as the first African American to perform with the New York Metropolitan Opera, is today one of the most celebrated singers of her time. In the early 20th century, the Pittsburgh Courier’s Jackie Ormes became the first African American female newspaper cartoonist. Civil rights activist Effa Manley, the first woman inducted into the Baseball Hall of Fame, was born and raised in Philadelphia in the early 1900s. In 1962, Allegheny County native Rachel Carson published her groundbreaking book “Silent Spring.” Today, it is clear that Carson’s environmental research, publications, and grassroots conservation efforts laid the groundwork for the creation of the United States Environmental Protection Agency. Stephanie Kwolek, an Allegheny County native and Carnegie Mellon graduated, invented Kevlar fabric — a high-strength material used today to protect police and military officers — in the 1960s. Contemporary Pennsylvanians like Alison Bechdel, a writer-illustrator whose works inspired a Tony Award-winning musical, and Loretta Claiborne, a speaker, advocate, athlete, and Special Olympian, reflect the spirit of their trailblazing predecessors and inspire the vision, action, and determination of the next generation of Pennsylvanian women. The distinguished accomplishments of Pennsylvanian women both past and present are diverse and significant, and have benefitted not only our state or our nation, but also our world. Pennsylvanian women have worked with vision and determination toward the progress of our citizens and communities. Today, we kick off Women’s History Month in Pennsylvania, as proclaimed by Governor Wolf. All month long, we will recognize the incredible contributions of women from all walks of life to the advancement and development of our Commonwealth and our nation. 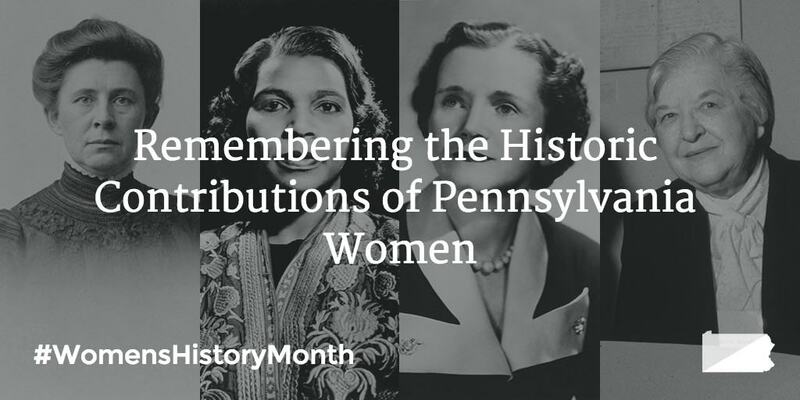 We encourage all Pennsylvanians to recognize the women who have left their imprint on the pages of history, as well as those whose leadership will guide us into a future filled with possibility and progress.